Browser - This represents objects like 'window', 'window.location', and the like. Improvements here also indirectly affect rendering performance. 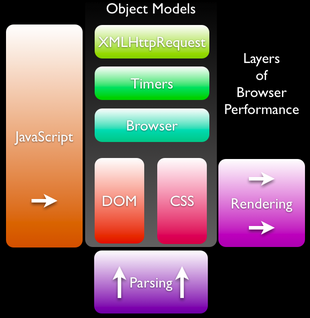 DOM and CSS - These are the object representations of the site's HTML and CSS. When creating a web application everything will have to pass through these representations. Improving the performance of the DOM will affect how quickly rendering changes can propagate. 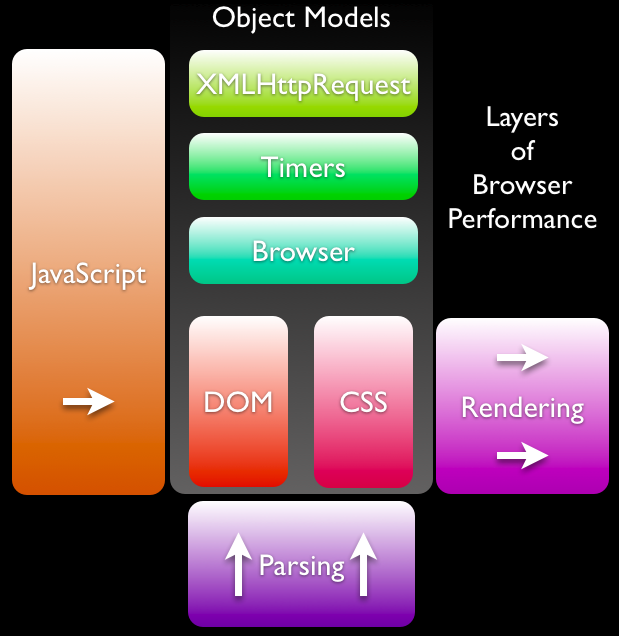 Parsing - This is the process of reading, analyzing, and converting HTML, CSS, XML, etc. into their native object models. Improvements in speed can affect the load time of a page (with the initial creation of the page's contents). Rendering - The final painting of the page (or any subsequent updates). This is the final bottleneck for the performance of interactive applications.